With the help of Grandma and my aunts these past couple of years, I’ve learned how to prepare almost every noodle soup that I giddily slurped as a child and hungrily craved as an adult. Grandma taught me how to tame pho bo and bo kho from her home kitchen, while my aunts showed me the ins and outs of bun rieu and hu tieu through detailed emails and patient telephone calls. I’ve amassed quite a repertoire of recipes on this site over the years, preserving a small piece of family history in the process and guaranteeing that all future cravings are swiftly satisfied. Most recently, Grandma and I tackled bun bo Hue, a complex and heady beef noodle soup scented with lemongrass, packed with pork trotters, and littered with congealed pigs’ blood. 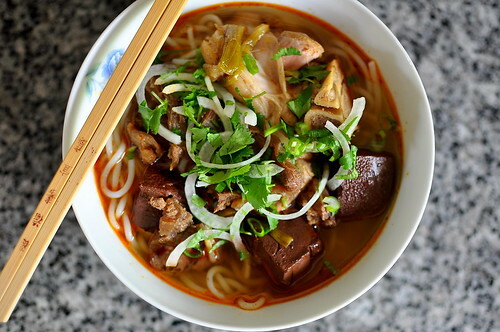 While the city of Hue is known for its spicy fare, Grandma’s version of the former imperial capital’s famous noodle soup is quite tame because she’s needed to refine and adjust it over time to placate the palates of her American-born, spice-averse grandchildren. What can I say? My cousins and I were weak when it came to heat when we were younger. The most magical part of making bun bo Hue happens around hour three when the beef, pork, and lemongrass broth is transformed into the familiar fiery orange soup. 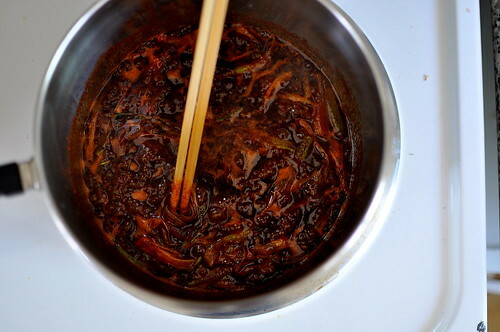 Grandma uses a sizzling mixture of vegetable oil, scallions, fish sauce, and paprika to impart the broth with its characteristically bright hue and rich, umami flavor. Never in a million years would I have guessed that a jar of paprika resided in Grandma’s cupboard for this very recipe. A heavy dose of fermented shrimp paste, along with a touch of sugar and salt, add the finishing touches to the broth. The soup is ready to be served when the slices of beef and the pigs’ feet are both perfectly tender, after approximately 4 hours total. 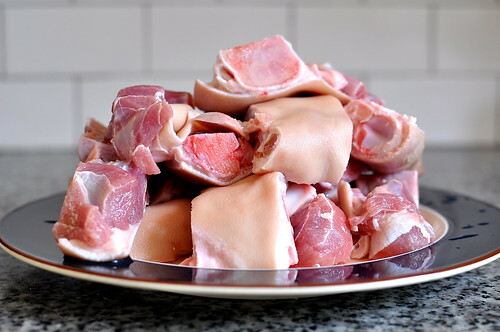 To prepare the broth, begin by cleaning the pigs’ feet under running water to remove any bits of bone debris that the butcher left behind. Don’t forget to run your fingers beneath the skin where unsightly debris may have gotten trapped. 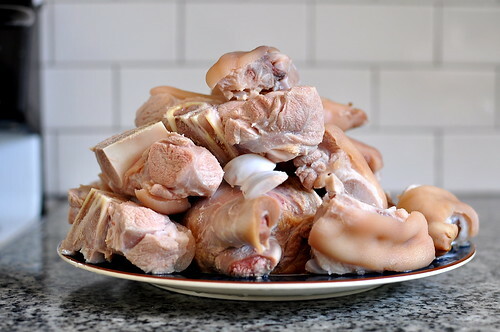 Place the cleaned pigs’ feet and beef shank in a large stockpot filled with enough water to submerge them and bring to a boil. The shank and feet are full of impurities, so once the water comes to a boil, dump it out and collect the feet and shank in a colander. Rinse the pigs’ feet once more to remove any remaining scum from the first boil. After giving the stockpot a thorough cleaning, fill it with 8 quarts of water, as well as the feet, shank, and 2 tablespoons salt, and bring to a boil. Skim the surface as needed using a fine mesh skimmer to remove any scum. Let the broth continue to simmer over medium-high heat, skimming the surface as necessary. While the broth is simmering, trim and bruise the lemongrass. 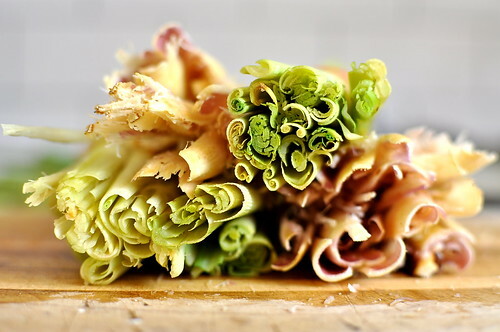 Cut the stalks in half and bundle tightly using rubber bands or kitchen twine. 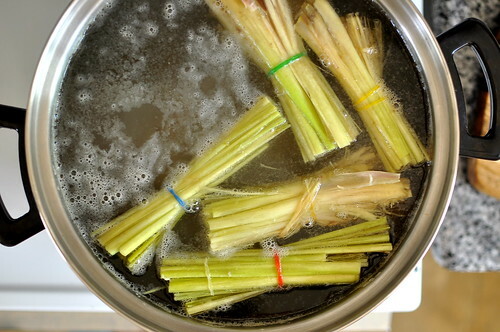 Add the lemon grass bundles to the simmering stock. 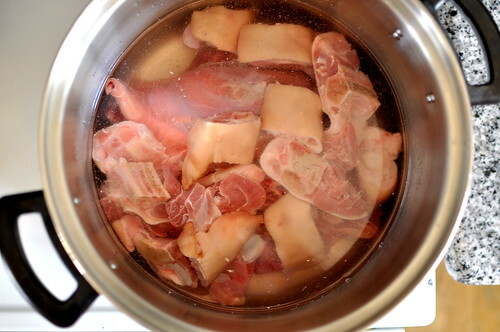 As the broth continues to cook, prepare the huyet or pork blood. 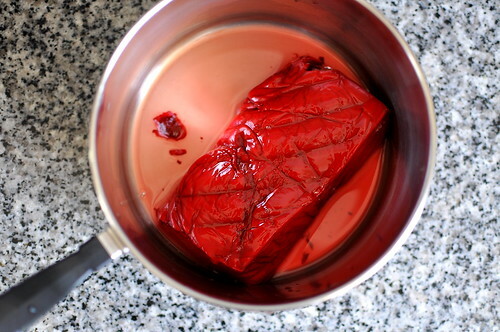 Place the blood in a medium-size saucepan and fill with enough water to cover the surface. With the heat on medium to medium-low, simmer the blood until it is fully cooked through, approximately 30 minutes. To check for doneness, cut the block in half to examine the center. 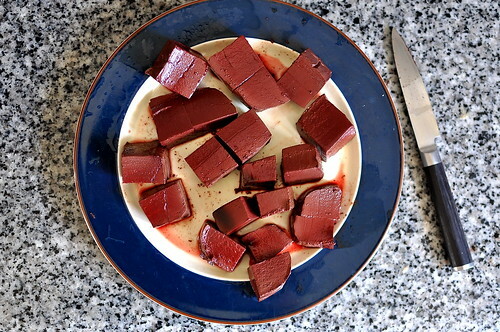 Once the blood is fully cooked through, allow it to cool and then cut into 1-inch cubes and set aside. Remove the beef shank from the broth when it has fully cooked through, approximately 1.5 hours. Allow it to cool slightly and then slice thinly. 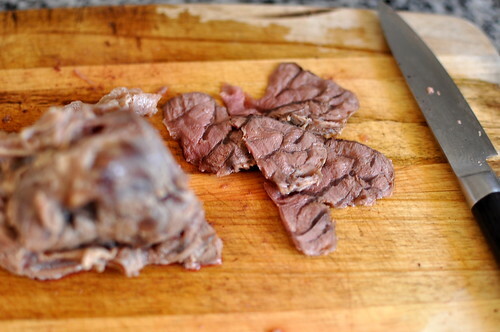 Add the beef slices back into the soup to continue to tenderize. 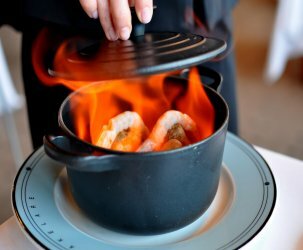 In a small saucepan, heat the vegetable oil over medium-high heat along with the scallions. When the scallions are wilted and golden, add in the paprika and fish sauce and combine thoroughly. Pour the mixture into the broth to give it its signature orange hue. 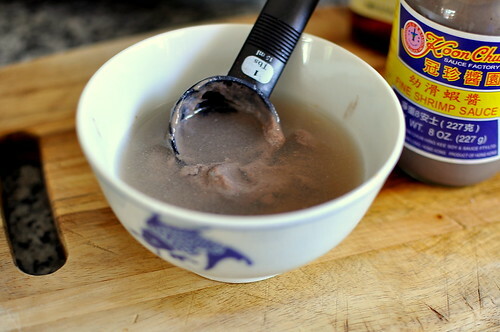 In a medium-size bowl, dissolve the fermented shrimp paste in 1/4 cup water and add to the broth. Additionally, season the broth with 1/2 tablespoon salt, MSG (if using), and sugar. Adjust the seasonings to taste. Lastly, add in the pork blood cubes. The soup is ready to be served when the slices of beef and the pigs’ feet are both perfectly tender, after approximately 3 to 4 hours of cooking. Serve immediately with rounded rice noodles, thinly sliced onions, and chopped cilantro. Where does one get congealed pork blood? Diana – It’s easier to find than you think! Asian supermarkets with a Chinese and Vietnamese clientele will certainly sell it. I purchased mine from the San Gabriel Superstore — comes pre-cooked if you’re squeamish! That looks like quite the undertaking; looks like so much fun though. 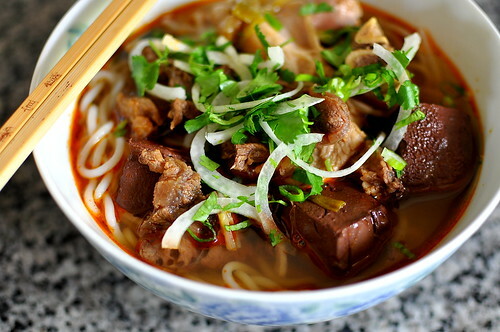 Bun bo hue is my favourite style of soup/noodle bowl so maybe one day I’ll make it too! I think majority of us growing up probably was spice adverse. But now as we get older the more we want it! 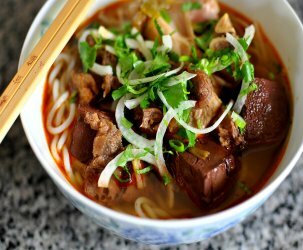 In preparation for our upcoming first trip to Vietnam (to anywhere in Asia, actually), I’ve been sampling bowls of bun bo hue here in the Bay Area, to get an idea of what to look for. 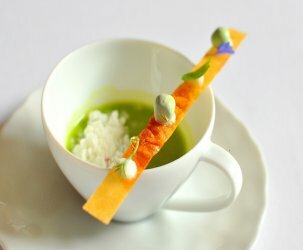 This recipe, and the outstandingly clear and helpful pix, will now be my touchstone … both here and there! anh – I was aware of the pineapple method, annato seeds too (for color), but I wanted to capture the way Grandma does it in this recipe. I will definitely be experimenting on my own for future batches. Thanks for the reminder! Pingback: Vietnamese Food: Bun Bo Hue from Pho Real & Gril in Tracy, Photo by Chris Gatmaitan :ChrisGat.com "See What This Guy Is Talking About"
This’s my favourite food!So surprise and shame that a foreigner could understand about Vietnamese’s foods than many any Vietnamese.